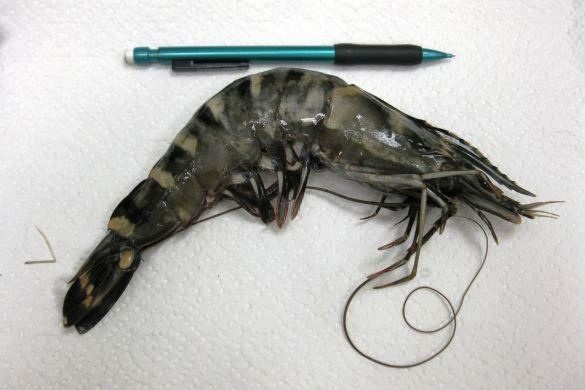 The Florida Fish and Wildlife Conservation Commission (FWC) is asking all anglers to be on the lookout for nonnative giant tiger prawn (Penaeus monodon) after a recent sighting in East Bay near Panama City in the Gulf of Mexico. The September 19 catch marks the first time a giant tiger prawn was reported to the FWC in Florida’s northern Gulf of Mexico waters. Biologists are also working to confirm reports of another sighting in Pensacola Bay. Reports have been common in Atlantic coastal waters, and three were reported off the coast of St. Augustine this summer. Named for the black stripes on its shell, giant tiger prawn also are known as black tiger shrimp and Asian tigers. Impacts, both negative and positive, are unclear at this time, but they could include competition for resources. Native to Southeast Asia and Australia, the large (8 to 12 inches long) shrimp was first introduced into U.S. waters in 1988 after an accidental release of about 2,000 shrimp from an aquaculture facility in Bluffton, South Carolina. About 10 percent of those that were released were later recaptured, some as far south as Cape Canaveral, Florida. After 1988, the next reported sighting wasn’t until 2006. Since then, several sightings have been reported along the Atlantic coast from North Carolina southward. Gulf sightings have been rare but are increasing in frequency in Louisiana, Mississippi and Alabama coastal waters. If you catch any giant tiger prawn, the FWC requests you report the size, date and location of the capture, preferably with the GPS coordinates, to Larry Connor at 352-357-2398 or [email protected]. Fishermen also are asked to either keep the shrimp for collection or take photos of them for identification purposes. It is unknown whether there is an established breeding population, but there are several theories on why fishermen are seeing more giant tiger prawns, including increased awareness among fishermen and accidental releases in the Caribbean and South America. Giant tiger prawn were a popular farmed shrimp in the ’80s and ’90s, but preference has shifted toward the more economically viable “Vanna Whites” (Litopenaeus vannamei), a Pacific white shrimp. 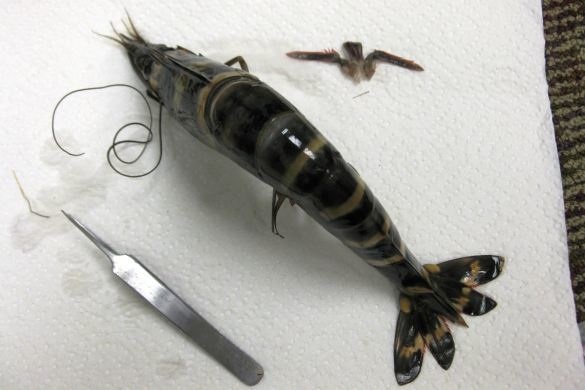 For more information on giant tiger prawn reports, visit the USGS.gov website.